Director – John Lasseter, Screenplay – Joel Cohen, Alex Sokolow, Andrew Stanton & Joss Whedon, Story – John Lasseter, Andrew Stanton, Peter Docter & Joe Ranft, Producers – Bonnie Arnold & Ralph Guggenheim, Music/Songs – Randy Newman, Animation Supervisor – Peter Docter, Animation Directors – Ash Brannon & Rick Quade, Art Director – Ralph Eggleston. Production Company – Pixar/Disney. Woody, the toy sheriff, is the favourite among young Andy’s toys and governs the other toys with benevolent wisdom. Andy then receives a Buzz Lightyear action figure for his birthday. However, Buzz has no idea that he is a toy and is certain that he is the real Buzz Lightyear, a member of the Space Rangers and here to save the universe from the evil Emperor Zurg. 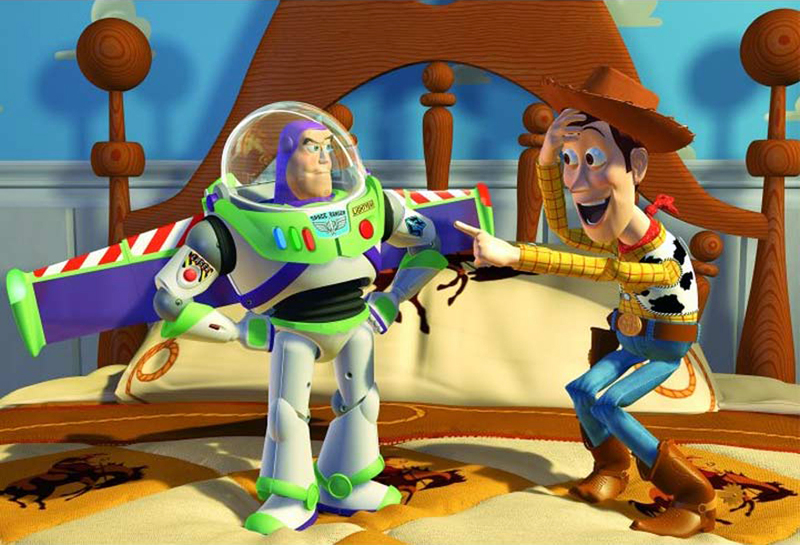 Woody becomes increasingly envious when the other toys believe Buzz’s claims and Andy starts to prefer Buzz to him. When Woody accidentally knocks Buzz out the window, the other toys believe he has killed him out of jealousy. And so Woody must venture out to rescue Buzz back from the neighbouring yard. However, both of them are then captured by Sid, the sadistic toy-torturing kid next door. Toy Story is one of the few films that can genuinely be said to have created a revolution. It was the first wholly computer-animated film. Earlier animated films such as Disney’s Beauty and the Beast (1991) and The Lion King (1994) had made use of computer animation in crafting three-dimensional animated shots but had still relied on traditional hand-drawn techniques in the end. With Toy Story, Pixar formulated the technique of constructing characters as a series of digital models with limbs and facial expressions that could then be moved in any direction inside the computer environment. The result was animation wherein the animation camera could track and move through the computer-generated action three-dimensionally in exactly the same way that a tracking shot could do with a live film. Toy Story propelled its company Pixar, now a subsidiary of Disney, to the forefront of animated art. In the next few years, a number of other companies – Blue Sky Studios, Illumination, DreamWorks SKG and their new animation division – jumped on the CGI animation bandwagon. Within the space of a decade even Disney themselves switching over from hand-drawn to computer animation. Although, it should also be pointed out that for all the recognition that Pixar were receiving for their revolution on the big screen, Canada’s Mainframe Entertainment had been creating entirely computer animated output first and in the much rigorous environment of weekly television, beginning with Reboot (1994-8). Behind Toy Story lies the feeling that it has been made simply because it could be – to satisfy the filmmakers’ sense of achievement ie. 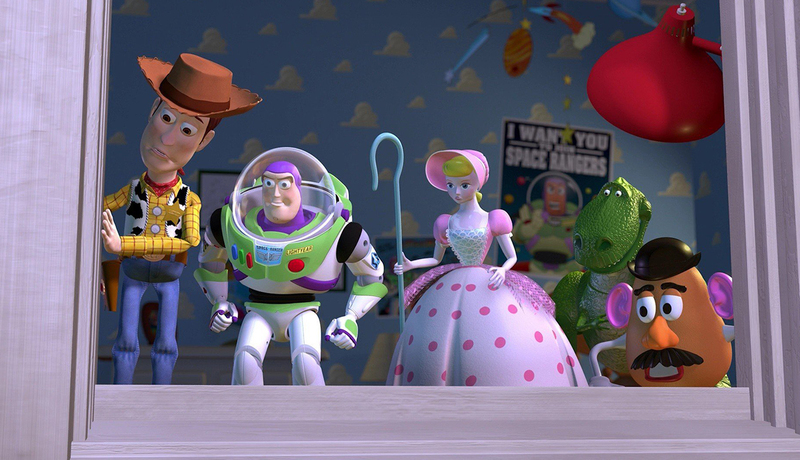 there is nothing in Toy Story, apart from the three-dimensionality of the animation, that could not have been conducted using traditional hand-drawn techniques. Certainly, the technical proficiency on display is dazzling – the film moves kinetically, is able to pan about in three dimensions and does many other things that classically drawn animated films are unable to do – from a technical standpoint. The faults of the process are the faults that computer animation as a whole took several years to find a means of rectifying – the slightly too perfect geometric depth of atmosphere and the fact that its surfaces seem to be too flatly drawn. This flatness of surface serves well when it comes to creating the faces of Woody, Buzz et al; on the other hand, the human faces seem grotesque and plastic. Nevertheless, Toy Story is a great deal more enjoyable than simply technical achievement for achievement’s sake. It moves at a fast pace and most of all it is plain good fun. The script, co-written by Joss Whedon, the godfather of the Buffy the Vampire Slayer phenomenon and creator of the muchly underrated tv series Firefly (2002-3) and director of The Avengers (2012), comes with an appealing sense of humour – Toy Story is one of the rare animated films that found an audience as much with adults as kids. The basic premise is a variation on the ‘Secret Life of Toys’ theme familiar in fairy-tales, given an update with contemporary toys (many of which are available on shelves. Pleasingly, as opposed to many other films with toy-related themes, Toy Story never gets all PC and stands up on a platform to remonstrate against war toys but simply includes them as part of the spectrum). The story is filled out with much more substantial characterisations than are common to animated features – with the cowardly Woody and Buzz Lightyear, the hero who fails to see he is a toy, being particularly unique and original characters. Although, the most appealing characters in the film are a breed of identical three-eyed alien toys that live in a toy-grabbing coin slot game and anticipate the coming of the claw with religious reverence in gleeful high-pitched voices. Pixar followed this up with Toy Story 2 (1999), Toy Story 3 (2010) and the upcoming Toy Story 4 (2019). The character of Buzz Lightyear was spun out as the hero of a standard animated tv series Buzz Lightyear of Star Command (2000-1). The banal Buzz Lightyear of Star Command: The Adventure Begins (2000) was a film released to video as promo for the tv series. Pixar’s other animated films are A Bug’s Life (1998), Monsters, Inc. (2001), Finding Nemo (2003), The Incredibles (2004), Cars (2006), Ratatouille (2007), Wall-E (2008), Up (2009), Brave (2012), The Good Dinosaur (2015), Inside Out (2015) and Coco (2017), plus assorted sequels to many of these. (Winner in this site’s Top 10 Films of 1995 list).